The Dasht-e Bayaz and Ferdows earthquakes occurred in Dashte Bayaz, Kakhk and Ferdows, Iran in late August and early September 1968. The mainshock measured 7.4 on the moment magnitude scale and had a maximum perceived intensity of X (Extreme) on the Mercalli intensity scale. Damage was heavy in the affected areas with thousands of lives lost in the first event and many hundreds more in the second strong event. 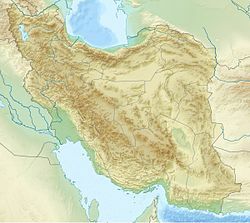 The Iranian plateau is confined by the Turan platform in the north and the Zagros fold and thrust belt and Makran Trench in the south. The Arabian Plate is converging to the north with the Eurasian Plate at a rate of 35 millimeters (1.4 in) per year, and is diffused across a 1,000 km (620 mi) zone resulting in continental shortening and thickening throughout the plateau, with strike-slip and reverse faulting present, as well as subduction at the Makran coast. The first earthquake occurred on August 31, 1968, measuring 7.4 on the moment magnitude scale and destroyed five villages in the Dasht-e Bayaz area, and at least half of the buildings in another six villages from Kakhk to Sarayan. A strong aftershock on September 1, measuring 6.4 on the moment magnitude scale, destroyed Ferdows. More than 175 villages were destroyed or damaged in this earthquake.